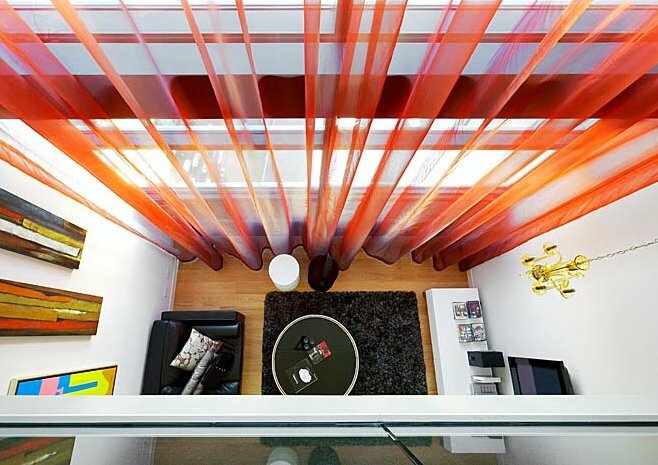 Bold colours in small bursts are what add excitement to the visually appealing Lumiere loft. 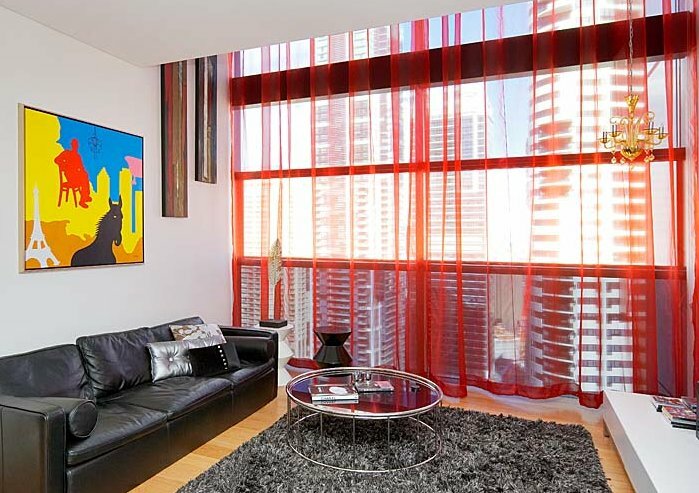 A colour scheme predominantly consisting of red, black and white keeps the design simple and sophisticated, and yet averts any chance of boringness or chromatic monotony, with pops of colourful vibrancy defining the apartment. 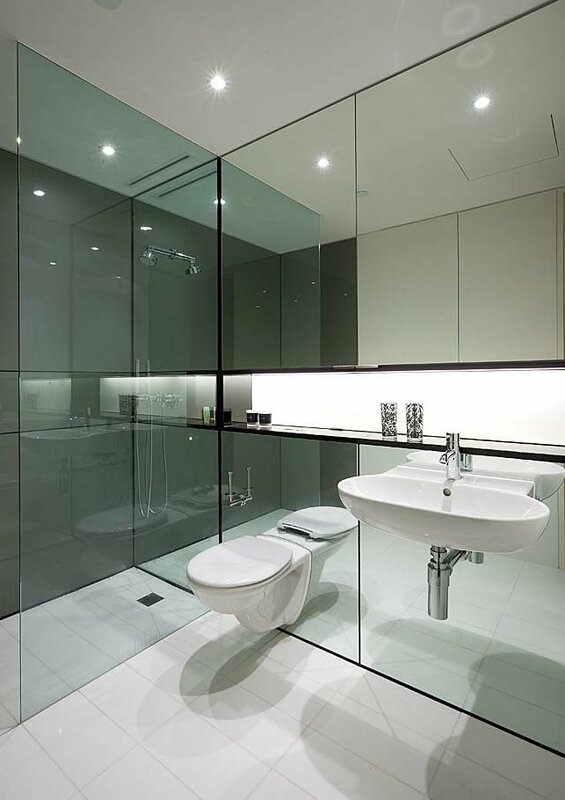 Amgad Kamel Interiors have taken this Sydney loft-style with a modern, clean-line approach that highlights the double height ceiling in the living space, and utilises mirrored walls for an optical illusion-type effect; the appearance of augmented space size in the kitchen and bathroom is conjured through this technique. 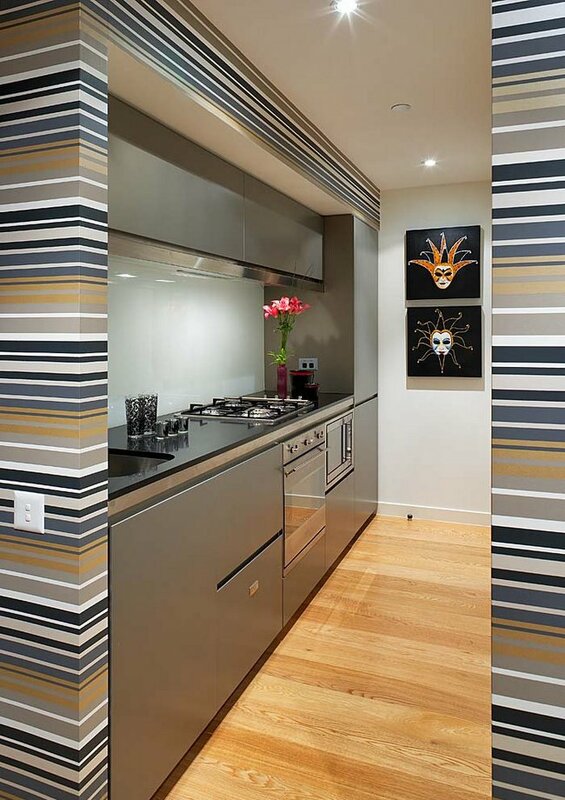 The gallery style kitchen one of – if not the – most visually defining spaces in the house. 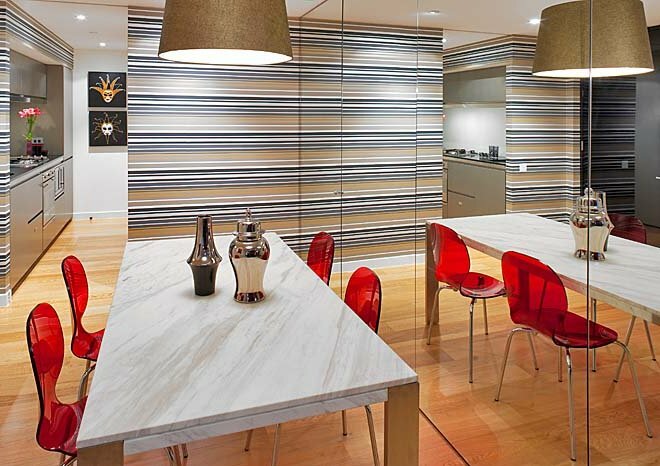 In combination with the mirrored wall, horizontally flowing striped feature walls adds width to the room, further enhancing the space. The red translucent chairs epitomize contemporary furniture trends, as well as continuing the colour scheme into the kitchen, without overwhelming it (whereas solid red chairs may have had this effect). The metallic appliances and cabinets, along with the decorative ornaments on the dining table, create a consistency between the cooking and eating areas through this colour continuance. 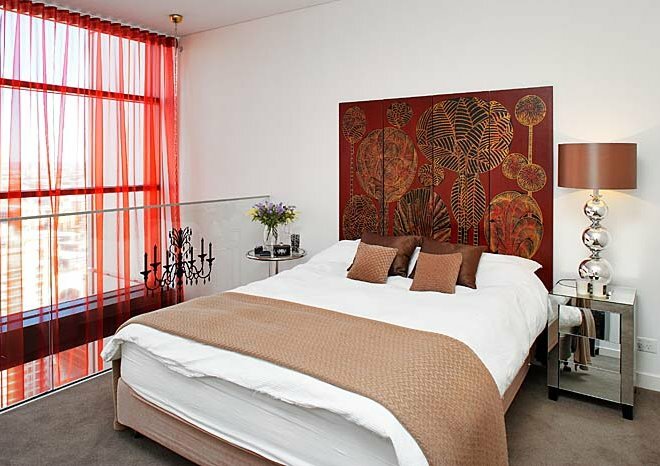 The drapes in the living room and bedroom are one of the signature pieces of this apartment. 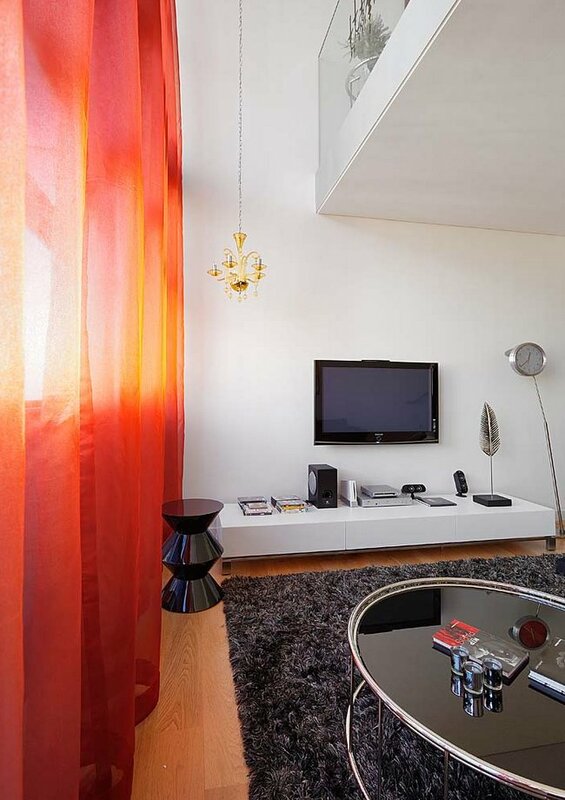 Their hint of red color adds vibrancy without overwhelming the room. 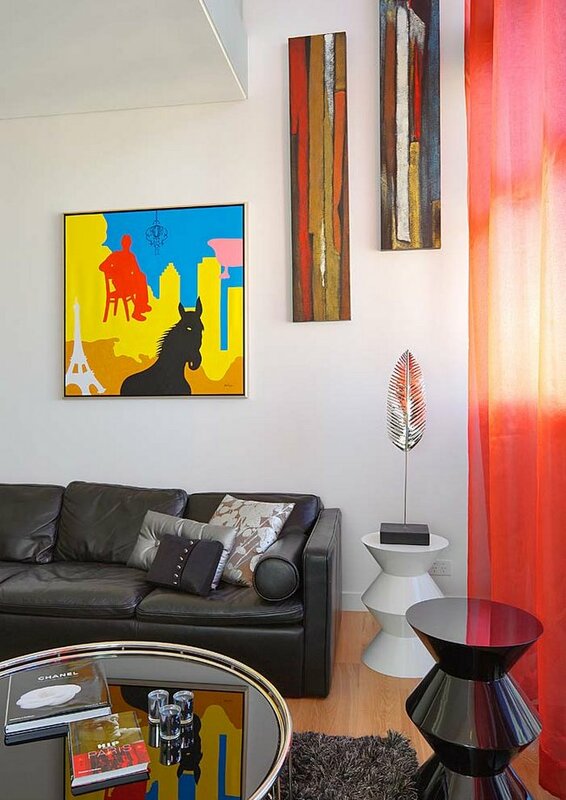 The statement artwork picks up on the black, red and white hues within the living room space. The classic chandelier in a contemporary loft-style space is an attribute of Amgad Kamel Interiors signature style – marrying the classic with the contemporary. In the bedroom, the carved wall panel bed head is a bold design choice, but one that works with its brown and tan hews tying into the lamps, cushions and blanket. The red curtains which flow from the ceiling to the living room below work to elongate the room, and also pick up on the red undertones in the central artwork. 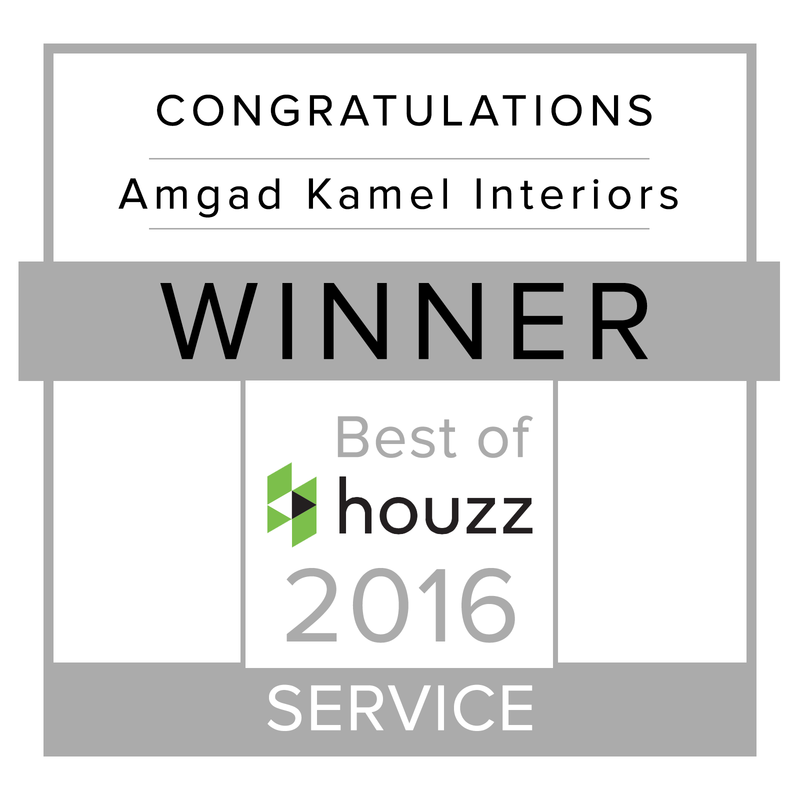 The loft is visually stunning; with Amgad Kamel Interiors’ meticulous attention to detail ensuring every facet of the home is coordinated to achieve a harmonious aesthetic affect. Space is maximised, and The Lumiere loft is given an appearance that transcends the mere injection of current trends into a home, but creates a timelessly classic, attractive and liveable space to enjoy.